Forward Chandler Parsons went through a lot in his four years playing for the Florida Gators. From finding early success to being locked out of the gym by head coach Billy Donovan to becoming the first basketball player school history to win the Southeastern Conference Player of the Year award, Parsons reflects on his college career fondly but is equally excited looking ahead to his future playing in the NBA. One of 54 players invited to the official 2011 NBA Combine in Chicago, IL from May 18-22, Parsons is currently in California working on refining his game and improving in any way he possibly can to get prepared for workouts, individual team meetings and the 2011 NBA Draft on June 23. After completing a rigorous day of workouts on Monday, Parsons sat down with OGGOA for an extensive interview about his future playing professionally and career in the orange and blue. ADAM SILVERSTEIN: Let’s start off by talking about what is going on for you now that the season is over and you are preparing for the draft. What have you been doing recently to get ready and how is it going? AS: What specifically are you working on and trying to showcase at the combine? Has your post game been a specific focus? AS: What have you heard from your agent in regards to a projection for the draft? Read the rest of our exclusive interview with Chandler Parsons…after the break! AS: ESPN’s Chad Ford had some high praise for you after watching you in workouts recently. When you read praise like that, do you block it out or do you use it to reinforce what you’re doing so you work harder? AS: Let’s go back to your senior season at Florida. You went through a rough patch in the beginning of the year and said your goal was just to stay confident and keep taking shots. How tough was that game against Central Florida for you seeing as you did not perform your best in front of friends and family in your hometown? AS: Once you were able to put some solid scoring efforts together in January, did the shooting hiccups just work themselves out? AS: Had you ever played in a game before like that road contest at Auburn? How difficult was that for the team to fight through when nothing was falling for anyone? AS: You suffered a deep thigh bruise against Tennessee. Were you in a lot of pain the rest of the game or were you running on adrenaline and it hurt more after it was over? AS: You only missed that one game and came back in the win against Georgia. How tough was it to play through the injury at that point as well as through rest of the year? I know it lingered for you at least through the beginning of March, right? AS: You guys prevailed against Kentucky in the first meeting at home, had the hard-fought game on the road against them and then fell for the second time in the finals of the SEC Tournament. What did they do differently that allowed them to prevail in the latter two games? AS: Obviously you were happy to win SEC Player of the Year, but how did you and the team feel about being able to bring home the SEC Coach of the Year award that Billy Donovan had deserved numerous times but not yet received until this year? AS: As the NCAA Tournament came to a close, he was criticized for his strategy and some of his play calls when games were close or tied. A lot of people don’t take into consideration that just because a play is called or you want to do something on the court, it doesn’t mean the other team will let you accomplish your goal. Looking back on some of those situations, how much of it was coaching versus execution? AS: During the press conference after the tournament, the seniors were obviously depressed and it was quite visual in everyone’s mannerisms and expressions. Did the three of you ever get a chance to sit back and appreciate what you accomplished or is it one of those things where it just continues to hurt knowing what could have been? AS: There is always talk about the close relationship the Oh Fours had at Florida and continue to have now that they have left. How close did the three of you get, and was bringing Vernon Macklin into the fold a natural fit? AS: Tyus has had good games in his career, but his performances in the tournament were inspired. How did he handle the success he had at such an important time? 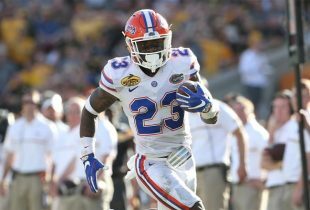 AS: Looking ahead to next year for the Gators, you won’t be there but Florida has plenty of young guys hoping to build on the success your team had last year. Can you talk a little bit about the team’s potential for the upcoming season? CP: “Even though I’m not there, I’m going to be a Gator fan for the rest of my life, so I’m going to be watching those guys. It’s going to be interesting because obviously I’m not going to be there everyday, so sometimes I’ll be scratching my head like, ‘Why are they doing that?’ or ‘Why are they doing this?’ Coach Donovan is going to know what he’s doing. We’re going to have so many guards next year with Erv, Kenny [Boynton], [Mike] Rosario, Scottie [Wilbekin], Casey [Prather] and Brad Beal coming in. I can see us at times even going in a four-guard set. We’re going to score a lot of points. Those guys can really shoot the ball. From what I’m hearing about Brad Beal, I hear he’s an absolute monster. And I’ve seen Mike Rosario in practice absolutely light it up. Those guys really put the ball in the basket. AS: Rosario is a player who some casual fans may not know about because all he’s been able to do is practice with you guys while he sat out this season [transferred from Rutgers]. What kind of role do you see him playing for Florida next season? AS: As the regular season ended and you were heading into postseason action, Donovan lauded you with a lot of praise and couldn’t stop talking about your development over the last four years both as a player and teammate. How hard was he on you those first few years, and how has your relationship developed since then? CP: “When I came in as a freshman, I had the total wrong mindset. I had everything figured out. This class just won two national championships; our class is going to come in and be just as good. And we weren’t. Coach made it clear that he was going to put our backs against the wall. He was going to challenge us and get the best out of us. The first two years were extremely tough. You know everything that happened – getting kicked out of the gym and all that. Never in a million years would we have thought the years would have went like that. On the same hand, we were I think 8-8 in conference and then 9-7 in conference and we were on the bubble every year for the tournament. Obviously that’s not the standard we want to have at Florida, but other schools have had a lot worse records and a lot worse years than we did my first two years. We still won a lot of games; we still beat some impressive teams. Parsons really is a great Gator, I’m very grateful for all his hard work. He really could grind out a win even when we weren’t at our best. Glad he’s getting some respect, hopefully in translates in the draft. Thanks for another great interview Adam. We watched Parsons become a man. Now he’s ready to go out and be that man in the NBA and in life. Every recruit should look at tenure in Gainesville, because it proves that Coach Donovan develops his players. Great interview, Adam! I hope Parson’s trainer is right about how high he could go, that kid deserves it. Definitely a Gator great.